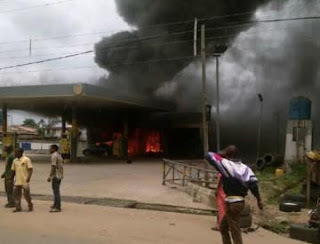 Two children of the same parents were burnt to death in a fire outbreak at `Bovas’ petrol station in Osogbo on Wednesday, News Agency of Nigeria (NAN) reports. An eyewitness who spoke on condition of anonymity, told NAN that the victims were children of the owner of the station. The mother of the children also suffered burns while trying to rescue her children. The Director of the state Fire Service, Mr Michael Ogundipe, who confirmed the incident while speaking with journalists said that two lives were lost in the fire and that the cause of the fire had yet to be determined. "We responded immediately we were called and sent two vehicles. We have equipment but there was congestion on the road which slowed down our movement. We met the fire burning and observed that the construction of the building did not follow the guideline. There was no exit route. No fire extinguisher was there. They would have been able to battle the fire if they had extinguishers,” he said. The director said that the remains of the children had been deposited at the Ladoke Akintola University of Technology morgue while their mother was also receiving treatment at the same hospital. Eyewitnesses said the woman and her three children were inside the mini market attached to the filling station when the fire started. The woman was able to rescue one of the children.